I wanted to make a simple side salad with this (just mesculin mix and a vinaigrette)? Thoughts? Strehan, any salad will be lovely with this pasta. Good olive oil, good wine vinegar plus salt and pepper, and you’re good to go! Also, truffles are out of season so I bought truffle butter…how do I prepare the sauce? Do the same thing except with the 3 oz of truffle butter (instead of making my own)?? Hi, there! So you’ll combine 2 Tablespoons of your truffle butter with the flour, gently saute until it becomes blonde in color, then add the cream and whisk until the sauce is thick. Then add the remaining 2 Tablespoons of truffle butter a little at a time, whisking until it emulsifies into the sauce. Hi Ben 🙂 thank you so much for this post. We just finished watching season 2 of Masterchef and when Jennifer made these I was positively drooling by the end. I already love to cook but the show has been such an inspiration! My boyfriend and I really want to make these but I will take your advice and start with simpler pasta first. You were one of my favourites by the way! I was so proud of how far you made it and I’m glad to see how successful you’ve been. Lisa, you’re so sweet, thank you so much! This recipe is actually fairly easy and CAN be done by beginners, as long as you have a pasta roller and follow the directions carefully! Hi Ben. My wife just got me a pasta machine (manual) and I am loving it! I can’t get enough of fresh pasta and would really love to try this recipe (I have made a few batches of ravioli which came out amazing so I want to finally give this a good try). About the truffles: I looked in my local market and saw a few products: black truffle carpachio which is something like this: http://www.sabatinostore.com/truffles/truffle-sauces-creams/summer-truffle-carpaccio although it may have been a different brand. They also had truffle oil (which had a small piece of truffle on the bottom and finally something that looked like sort of ground truffles with some olive oil. The only thing that seems like it may work for this dish is the first item. What are your thoughts on this? I can’t find any plain truffles. Thanks Ben! Hi, Sam! The black truffle carpaccio is a superior choice to the truffle oil. 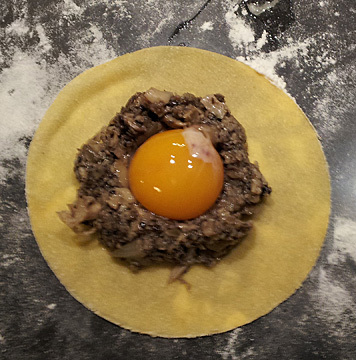 It’s not truffle season, unfortunately, and I usually only make this dish during the season. (Late winter and early spring.) You may also be able to find canned/jarred black truffles. The flavor of EITHER product will not be right, but it’ll be a close facsimile. This sounds amazing! I love making fresh pasta. I wonder if instead of mushrooms, can I make a nest of some braised beef? Dolores, your imagination is the only limit here. Braised beef would be delicious for this recipe. My husband just bought me an Atlas pasta machine and I can hardly wait to start playing with it. I will take your advice to do noodles first before I tackle this recipe. 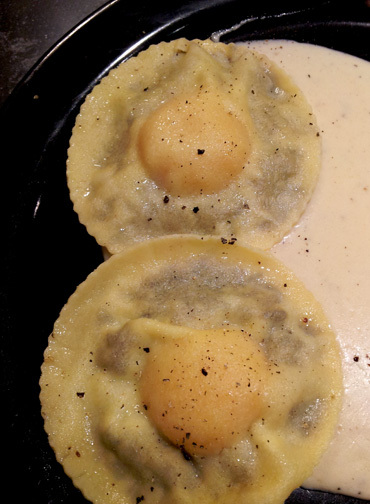 And I’ll probably do the mushroom filling by itself in smaller ravioli’s before I take on the raviolo monster. But that black truffle cream sauce…why do I think I’ll want to use it on everything including Rice Krispies?